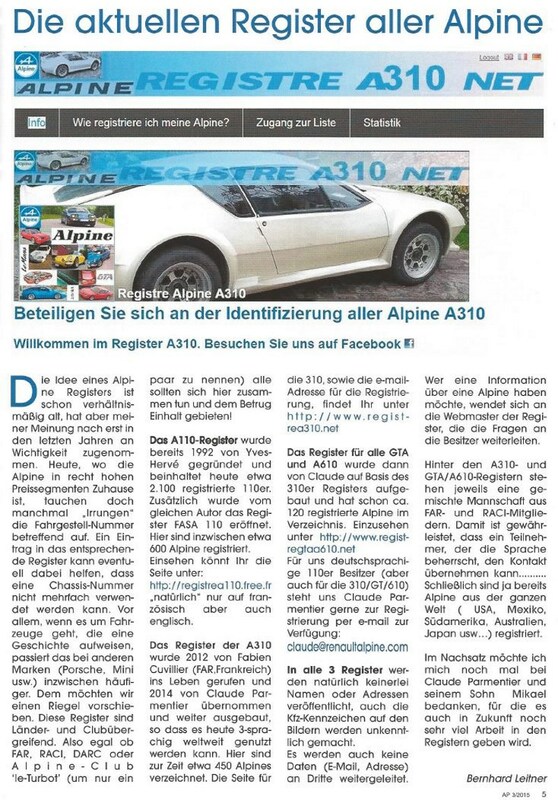 This site intended only to identifying and compiling the Alpine A310 V6 or L4 that you own or owned to make an inventory of survivors of this exciting car. Hopefully we will limit the occurrence of duplicate car remanufactured from chassis plate while papers are elsewhere. Here we don't judge we don't denigrate. What is in perfect original condition, modified to the extreme, a wreck or modified in an original wreck, no importance it's accepted as it is. 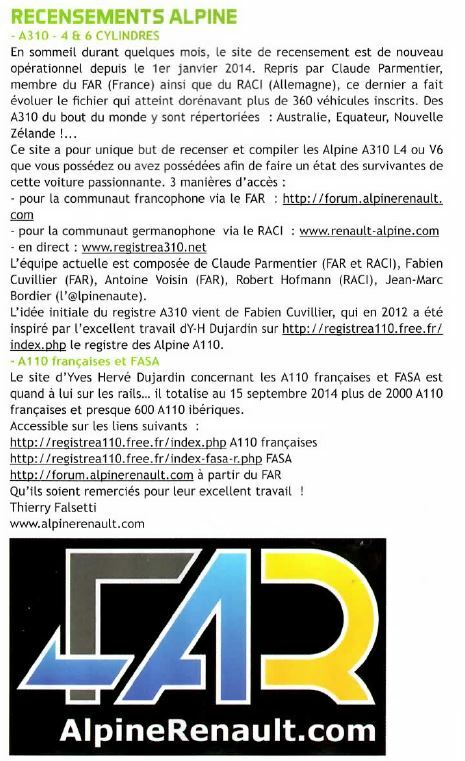 For further head to the FAR https://forum.alpinerenault.com or to the RACI https://www.renault-alpine.com/ two guiding lights for the Alpinists. 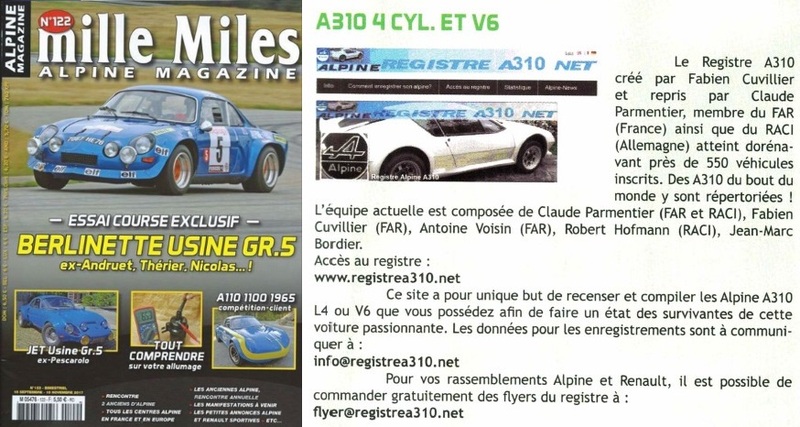 Flyers: If you are planning a Alpine event, and want to distribute flyers for the A310 registers (or GTA / A610), write to us: flyer@registrea310.net specifying the desired number, postal address and date of the event. We will send the flyers for free. The information given in this list only commits the person who sends them to us. 31 Tulipe noir métal black schwarz ? ? ? ? ? ? ? ? 32 Bleu pervenche blue blau ? ? ? ? ? ? ? ? 33 Noir black schwarz ? ? ? ? ? ? ? ? 35 Vert normand métallisé green grün ? ? ? ? ? ? ? ? 37 Bleu lagon blue blau ? ? ? ? ? ? ? ? 345 Bleu cady blue blau ? ? ? ? ? ? ? ? 356 Jaune compétition yellow gelb ? ? ? ? ? ? ? ? 907 Vert jardin green grün ? ? ? ? ? ? ? ? Interior features A310: According F.Lhospied, author of "Alpine Renault A310", the inside of the A310 4-cylinder was the choice of customers.